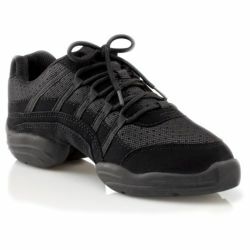 The Rockit dance sneakers are one of the best selling sneakers for dancers available. They feature a combination Nubuck and imitation suede upper that is combined with lightweight and breathable nylex mesh vents for air circulation, they have a perforated arch for ventilation and breathability, flat boxed toe for toe stands, split sole for flexibility, not-marking soles, and a speed looped lacing system for a snugger fit. The adult Rockit dance sneakers are colored as pictured and are available in adult size 5.5M – 14M. Women order street shoe size, men order two sizes up.